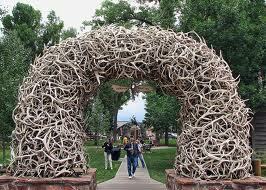 Jackson Hole Wyoming …. The stillness of the morning wraps around me and the warmth of the coffee cup in my hand, helps me to appreciate what the road I have traveled, has brought me to this morning. The hard bench of the picnic table seems like only a minor inconvenience as I soak up the grandeur of Jackson Hole, and this wonderful spring like morning. High up in the branches of a stately lodgepole pine, I hear the familiar call of a Blue Jay and all is well in my world. My life seems serene and circumspect, and then the GM Diesel in the old 4107 roars to life! Blue smoke diesel exhaust fills the air, and like a gentle fog, engulfs everything in sight. That is the bad thing about early risers, they fire up at just barely the crack of dawn, and if they are driving some poorly maintained exotic relic of the late forties or fifties, they do not have any air pressure at all. So they will run the old bus for what seems like a lifetime, before they are ready to release the brakes and leave the campground. This in turn, does not make us many friends in the community of man. I used to hate old buses with a passion, I did not care how slick they were or how many hours the operator had put into them, to me they were smoke belching monsters that ran far too long in the campground before they finally left. I really disliked them because they were noisy and I was often still sleepy. Many a time found me not a big supporter of bus folk. Their loud pipes, noxious fumes and seemingly callous attitude toward other campers did not enamor me to them at all. That school of thought was fostered mainly because I did not understand the methods and benefits of good maint. and the headache and anxiety of bad air lines. Now days, it is not so bad, I understand buses and bus people a little bit more than I used to. This kind of makes me a little sympathetic to their needs. Daddy’s Hobby our bus, can sit for several days and still fire right up and move out, immediately, because it doesn’t have a whole lot of air leaks and will hold a ready supply of sail boat fuel whenever I need it. They say old habits are hard to break, and to some point, that is true. I no longer get up early and hit the road to get a good start on the day. We kind of linger a little, sip on the coffee, sit around and while away the time, watch the parade out the front gate, and when we are ready, we fire it up and we leave. So here it is, the take away, where the rubber meets the road. I have found out, albeit somewhat late in life, that if you are in a hurry you should not be driving a bus. If you don’t want to make new friends and impress the locals, you leave at a decent hour. 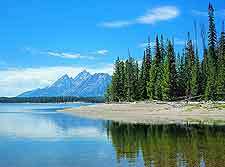 And if you can, you try your best to route yourself thru Jackson Hole, Wyoming, because it is a really neat place, and worth more than one visit in this lifetime. This entry was posted in Blogging, Bus Life, Life, Oklahoma, Recent. Bookmark the permalink. 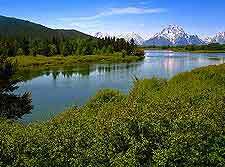 I haven’t been to Jackson Hole in many years, but I’ve probably been there 4 or 5 times in my life. I really enjoyed the early trips (in my 20’s) where it wasn’t so commercialized and so many people running about. We tent camped mostly back then. Tent campers and bus people were always getting into some kind of disagreement… I laugh about it now, but it was really aggravating back then. Here I am still lamenting: Why can’t people just get along?? My first encounter with Wyoming was on a Harley, 5X8 pup tent, eating beans out of a can and smoking reefer, the whole nine yards. Later on came the truck and the camper, kids, and all the trappings. As I said in the piece, “I did not understand the mechanic’s of bus ownership” and that caused some of my problems. But also, there are guys who let them run far too long before leaving, and they do everyone else a dis-service. Yup, as soon as you have enough air to release the brakes you should be moving! And what is it with these guys that have the 5th wheels that fire up their trucks and let them run for a half hour??? They don’t have air brakes and they make as much or even more noise than a bus. A great many campers do not respect the rights and privacy of other people, same thing with motels in general. I like to go over to their rigs, when they are sleeping in the middle of the night (usually around 4:30 am or thereabouts), just before I leave, and unplug ’em! One of these days I will most likely get shot. Thanks for checking in, we appreciate your comments. We have afew KOA camps in and around San Joaquin county here in California. Used to be one less then a mile and a half on 8 Mile road, which intersects I-5 to hwy 99. I’ve seen pics of your bus, even had the privilege to hop aboard John Madden’s bus years ago when he was leaving his home in Pleasanton, CA to go cover NFL games on the road. I’ve always been curious about people who load up their “tent” trailers, SUV’s, yes, and their buses with all the creature comfort of the homes the just left? I had to pick up a friend of mine, a fellow hot rodder, a year or two ago at that KOA camp down the road from me. When I pulled into the entrance, I happened to see all the “layouts” of various vehicles, tents, whathaveyou. There were Dish, Direct TV, and Comcast poles and the like in and around ALOT of these “campers”. When John climbed into my ’54 Chevy I had at the time, I had to ask him: why do they even leave their homes? I thought they wanted to get away from it all for a little peace and quiet tranqillity? I understand you and your bride doing what you do with YOUR bus and all, and plenty of others like you; just don’t understand these other types that in reality are just moving from their house to a “moving” one ! Good strong observations as usual Joe. We have three televisions in our coach, three DVR’s and Sat.TV where we differ from most folks is “we hardly turn them on.” We made a trip last year for 23 days and never turned on any of them one time. Makes me wonder why we even have them. I find myself so caught up in the moment, being somewhere new, new sights, new smells, things just being so much out of what I am used to, that I want to soak it all in. Just sit in the shade and bask in the day and be in wonder of it all. Then the generator or some other noisy appliance fires up and it all goes out the window. I do believe they would take the house with them, if they could wrap a chain around it and drag it down the road. Thanks for your comment, stay cool. Joe, you might be surprised by the number of people that full time. 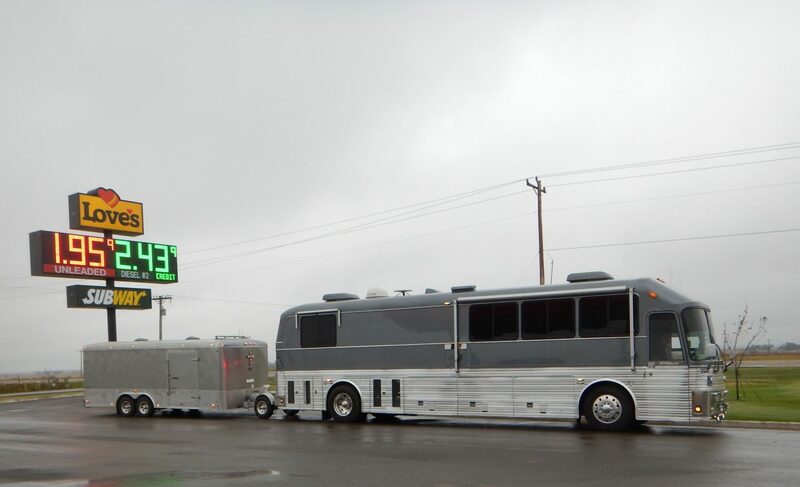 We have been in our bus for 9 years now and know people that have been doing it for up to 23 years. We don’t own a house or land anywhere. Ed, I know of what you speak ! I’ve met folks certainly retired, that have been on the road that long and longer ! To a person, they’ve all pretty much commented as to Don’s comment at “being caught up in the moment”. There are so many beautiful places to see in our US of A and if one has the “cash” and the time to do so, they they should use that advantage. Along the same train of thought, we’ve got over 1100 miles of waterways in the San Joaquin valley and folks that have lived on their house boats for about as long as the bus/RV people, except they travel by water when they feel the need to “catch that moment” !! !